IB Psychology is one of those courses that can be approached in a very traditional manner where the teacher is the sage-on-the-stage and the students are passive receivers of the teacher’s “fountain of knowledge.” To supplement this approach the teacher surely administers exams, assigns essays and research papers, probably does some demonstrations and activities, and facilitates some discussions. This approach has produced students that have a good base knowledge and have a proficient understanding of the subject area, which allows them to do well on the standardized, end-of-course exam. This approach doesn’t sit well enough with me, however. As I say in my educational philosophy, I just don’t endeavor to do things better, I endeavor to do better things. Thus, one of my goals as an IB Psychology teacher is to redefine the rigorous approach so that the students not only have a good base knowledge and have a proficient understanding of the subject’s content in order to do well on the end-of-course exam, but they also come away with the skills and frames of mind needed to be successful in today’s fast paced, constantly changing, and technology rich world. I think students learn best by doing. This goes for a psychology class, as well. Rather than being passive absorbers and regurgitators of information, I want kids to be active creators of relevant content and research while simultaneously developing the essential skills delineated by Wagner and others. I facilitate this process in more of a guide-on-the-side manner as opposed to the sage-on-the-stage approach mentioned earlier. 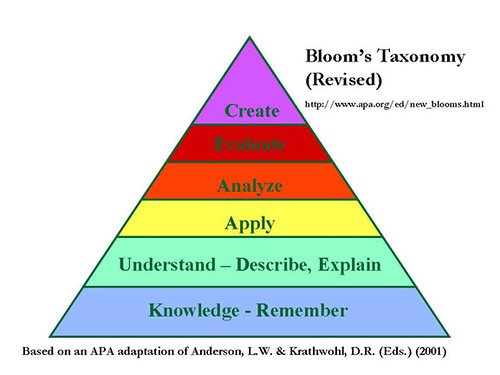 Cognitively, I base my approach on the revised version of Bloom’s Taxonomy. Instead of focusing lessons and assessment on only Remembering and Understanding, which is what you often see in the traditional psychology classroom, I shift these lower levels of the pyramid to formative assessment and personalized learning processes. Students can acquire this information mostly outside of class and I can check their understanding through conversations and other technology-based means. In class, I focus on the top parts of the pyramid (Creating, Evaluating, Analyzing, Applying) within the project-based learning activities and the summative, authentic assessments I facilitate. Fortunately, IB learning outcomes incorporate command terms that directly expect the students to think critically in-line with the top parts of the pyramid (these command terms are: Analyze, Examine Discuss, Evaluate, To What Extent), so with my coaching and guidance, students start practicing these thinking skills from the beginning of the course since they have to. Creating is the only one the IB leaves out, so I give students opportunities to create as often as I can. Lastly, communication, collaboration, global awareness, and digital citizenship are equally emphasized and assessed along with the content elements of the projects and assessments. Since I’ve been working in a dual role the last four years as both an IB teacher and a technology learning coach, I’ve endeavored to use in my own classes and help other teachers understand how to use technology effectively to transform the learning process. As with any risk-taking situation, there have been both successful and unsuccessful moments. But, the key thing is to make thoughtful attempts and always reflect on the process. We need to model risk-taking so that students see that informed risk-taking is a good thing, and to make mistakes in the process is ok as long as we reflect and work to improve on it. I continue to emphasize this approach with technology in my teaching. One of my professional goals this year is: Continue to design and refine technology-based learning activities in IB Psychology that have students effectively communicating, collaborating, critically thinking, and creating with the required content. Thus, I will continue to work on using technology as a critical tool in redefining the rigorous process in my IB Psychology classes. Students develop primary psychological research skills beyond the Internal Assessment requirement. When studying qualitative research methodology, I have the Higher Level (HL) students carry out a qualitative research study that is relevant to the school community. Based on a topic I define, they create the research question and work collaboratively to gather the qualitative data (through interviews, observations, or case studies). In the process they are expected to apply the relevant concepts that the IB learning outcomes for this HL topic dictate. And, they actually do an Inductive Content Analysis of their data. This is better than just having the students read and regurgitate about qualitative methodology. The students declared that they understood the concepts better from doing the process. Further to this, when we study the sociocultural level of analysis in the first semester of the second year, I have the students create and design a cross-cultural research study in order to more deeply understand the additional issues cross-cultural researchers need to keep in mind when they design a cross-cultural research study. Again, this creation, application, and analysis process deepens their understanding and makes the learning process more rigorous and engaging in an authentic way. Students reflect upon all major assessments and projects. This meta-cognitive process is essential so they learn about their learning and recognize both their successes and failures and improve on both situations in the future. Through out the course of the two years, I build independent learning skills with the students. They learn what is expected for each of the command terms; they learn how to find reliable and relevant sources, and they learn how to effectively organize their written responses. In the second year, I have them independently research, read, and respond to certain learning outcomes, i.e. there is no direct instruction on those outcomes in class. The students post their responses on the class blog, and I give them feedback in that digital environment. This is especially important for the HL students since they need to cover about 66 learning outcomes over the two years, and there just isn’t enough time to cover all of those directly in class. I build projects that integrate technology in a meaningful way. I have students create videos, podcasts, and photostories. In some instances these are published to add to the knowledge base of the world. The students blog often and use online collaborative tools like Google Docs, Shambles Pad, and Wikispaces. I would have them use social media like Facebook and Twitter, as well, but those are blocked here in China, unfortunately. I also have them do presentations often where they are expected to think about the slide design and the means in which they engage the audience through an effective mix of facts and storytelling. In these types of projects, I expect students to practice ethical use of information and media (audio, images, video) by using Creative Commons licensed media or by creating all the media themselves. These elements are assessed along with the content expected by the learning outcome. Students often collaborate in many contexts to build their understanding of the learning outcomes. They do collaborative processes both in-person and with technology tools like wikis, Google Docs, chat platforms, the class blog, and others. How well they collaborate is usually assessed along with the content about which they are collaborating. Through their developing research and information literacy skills, I frequently have the students choose the content they want to use to respond to the learning outcomes. Many IB Psychology learning outcomes are open-ended, allowing for various concepts and research studies to be used. When they can choose what interests them in responding to some of the outcomes, they are more engaged and more apt to remember the needed content for those outcomes. Of course, I do administer IB exam styles quizzes and tests under timed conditions two to three times a semester so students practice this skill so they can be as successful as they can be on the end-of-course exam. At the moment, the final scores they earn for IB are still important for their university admission process. But, I don’t approach the course as teaching to the exam. There are more important skills and learning processes the students need to develop for life in the 21st century than being good test takers. There will be more approaches and adaptations of these above processes as I continue my journey to redefine rigor in teaching IB courses. I would love to hear your thoughts and ideas, as well! Posted on October 11, 2011, in Education, IB, Psychology, Social Studies and tagged 21st century, shift, transformation. Bookmark the permalink. 2 Comments.